TO BE a successful makeup artist, you'll need a couple of things. You'll need a portfolio, you'll need your own website, and you'll need a social media presence. You'll also need a professional network that you've built up over time. But in addition to all these things, there's one other thing you'll need, and it's just as important. It may even more important that all those things. You need to be listed on the websites where people go to book makeup artists. When you become a professional makeup artist, you will not believe how much of your business comes from people who find you online. Literally, most of your work will come from people who found you on the internet. They may be getting married, arranging a video shoot, or doing local theatre, but far and away, the majority of your work as a MUA will come from a couple of websites. These are the websites that will make or break your makeup artist career. YES, eventually you'll be so big and famous that you'll be sought after by the biggest and most recognizable names in fashion. But until then, here are the websites where you need to be listed in order to get things started. First we'll look at the most popular sites that get a TON of traffic, and then we'll look at sites that are specifically for bridal makeup artists, editorial makeup artists, and so on. This is a pretty in-depth post, so feel free to come back to it if you need to! Before you read on, guess how many visitors Yelp gets every month. If you guessed "more than one hundred million," you'd almost be correct. Every month, 135 million people visit Yelp to look for services. Written out, that's 135,000,000 people per month going on Yelp! Not all of those people are looking for makeup artists, but many of them are, so get your information on Yelp! How Do I Use Yelp? You can "claim" your own business page on the site and arrange it any way you like, or you can pay to advertise your services and have your profile appear at the top of the search results (so, for instance, if you work in Tulsa, OK and someone goes on Yelp and searches for "makeup artists in tulsa", your profile would be the first one to pop up). Yelp has some pretty convincing stats on their business page, stating that "the average annual incremental revenue generated by a business claiming its free Yelp Business Page" is $8,000, and that the "the average annual revenue from Yelp as reported by Yelp advertisers" is $23,000. If you're going to get into the makeup game, you better make sure you pay attention to your Yelp page. How Do I Use GigSalad? There's a free membership, which allows you to set up a profile and have visitors see the makeup services you offer, and there's a paid membership, where you set up a "PromoKit" page, where people can see your services, and contact you directly to ask for a quote. Thumbtack is similar to GigSalad, in that MUAs can have a free account where they list their services, or a paid membership where they list their services and get a bunch of perks. Users fill out a form and have MUAs contact them. Thumbtack has declined in popularity in the past year; it used to get about 5 million visitors a month, and it is now estimated that it gets about 4 million visitors every month. Plus, it's nowhere near as big as Yelp. However, that doesn't mean that you shouldn't sign up. You need to try a bunch of different online advertising spaces, and see which one works (we'll talk about finding out which ones work in a section below). How Do I Use Thumbtack? As a makeup artist, you make your own page, and people who need makeup artist services fill out a form, and then you send them a quote (a "quote" is a declaration of how much you'd like to be paid for the job). Other makeup artists may also submit a quote, and the person needing makeup artist services would then choose the artist that she wants. The site is similar to Thumbtack, where people who need makeup services are put in touch with vendors (that's you, the makeup artist) and the makeup artist submits quotes for the jobs that visitors have listed. You can check out this page for more info. We have less experience with this one, but they seem legit, and on their website, they list some of the clients they've worked with: MTV, Coca-Cola, McDonalds, Tiffany and Co., Google, and Coach. Those are some pretty serious companies, so Gig Masters might be worth checking out. How Do I Use Gig Masters? It seems similar to Thumbtack, but again—we haven't used it, so we're not sure! Check them out for yourself. 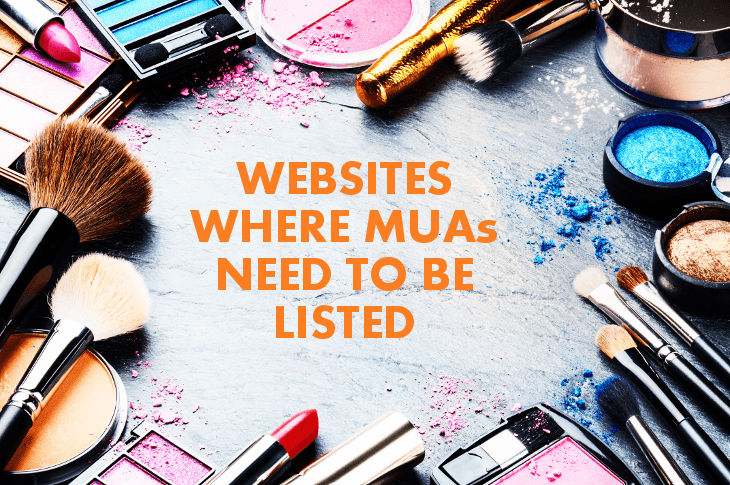 Here's something interesting: if you go to each of these sites and look for makeup artists in the city nearest you, you'll find that the same MUAs pop up, again and again—and that's because they've taken the time to advertise on each of these sites! Having your profile on these sites—and then maintaining it—is super important. A quick, final note: there are other sites, such as The Makeup Artist Network, that have a directory of makeup artists, but we've never really used that service. Feel free to check them out (or any others), and if they work for you—let us know! We'll add them to the list. So, the sites listed above are the big ones. They're the ones that, when people search for "makeup artist" in whatever city they live in, are the ones that are most likely to come up in the search results. But there are some other directories that have makeup artists in them, where people go to find specific types of makeup artists. In this section, we'll take a look at some websites that you'll need to be on if you want to work in fashion makeup or find jobs in film and TV. On their website, ProductionHub states that they get about six million visitors a year. That's much fewer than Yelp, but guess what: if you're a MUA with an interest in fashion or editorial work, this site could be much more valuable to you. They're used by numerous film and television studios, and they broker a lot of important production jobs. So, what does all the mean? ProductionHub is a marketplace that brings together production companies (people who make media content) with equipment vendors, freelance workers, and all other types of crew—including makeup artists. In other words, when people want to make a video content (for a television show, music video, workplace video, or whatever) they look at the artists listed on Production Hub. As you can see on this page, MUAs list their services, and people who need makeup artist services contact them for work. How To Use Production Hub: You'll need to sign up for an account, and then create a profile. You'll be able to list your website in the profile, which is an added bonus, because on your website you should have your profile, people you've worked with, and so on. Your potential employers will be able to see how incredible you are, because you've created and manicured your profile. And that's another bonus: ProductionHub is not a "user review" site, so nobody will come along and say negative things about you. The site is similar to ProductionHub, in that it's specifically for professionals and freelance professionals who work in film and video production. However, it's a little more difficult to get listed in Variety 411, because they verify all of the freelancers who sign up for accounts. As they write on their "Apply To Be Listed" page, they require three references that confirm you've got experience. They accept pay stubs, contracts you or your clients have signed, invoices, call sheets, and so on. How To Use Variety 411: Once you've got some experience, the site can be valuable to your career. They have pretty clear guidelines about submitting your information (and paying their membership fee), so once you've gotten a few legit gigs, be sure to check them out. It's also important to have a profile on Model Mayhem, if only for networking. You can list your experience and bio, upload photographs, post a link to your website, and link up with friends in the industry. Here's an example. Keep in mind that for editorial work, you're more likely to get jobs through your network and your business contacts. Whereas brides and non-commercial folks look online for MUAs, the creative directors who organize editorial shoots and photo shoots are a lot less likely to look for a makeup artist by going to a search engine. The sites above will help you, but if you're in the world of fashion and film makeup, building your professional network is really what will boost your career. Here's an area of makeup where having positive reviews across various online sites is SUPER important. If you're doing bridal makeup, you want to monitor your profiles on Yelp, GigSalad, etc, but you also want to pay very close attention to the following sites. A quick note: Many bridal / events sites allow you to become "Featured" artists, meaning—you can pay to have your information list at the top of their search results. This can be worth it, because most people will look at the MUAs on page 1 of search results, and never get to page 5 of the search results—and if you're on page 5, you're in bad shape! This is one of the bigger wedding sites, where brides and grooms go to find people who provide services that they need to throw a wedding. That could be venues, bands, DJs, and... yep, makeup artists. It's kind of like GigSalad, but whereas GigSalad is only for booking artists, Wedding Wire is only about booking companies that are affiliated with weddings. One of the best thing about Wedding Wire is that you can reply to comments that people have made—so if they love your MUA work and gush about you, you can thank them and look gracious—or if they leave criticism, you can defend yourself. That is a WONDERFUL option, especially if you've ever worked a wedding and had a stressed bride blame you for a mistake she's made. One quick note: Wedding Bee is another popular site, and it's a partner site to Wedding Wire (they're both owned by the same company). Wedding Bee is a little bit different than Wedding Wire, and you can buy advertisements on the site and once you add your info to Wedding Wire, it should appear on Wedding Bee, as well. Wedding Bee gets about 4.5 million visitors a month—usually brides looking for all sorts of services—so having an advertisement on the site can be a good business move. How Do I Use Wedding Wire? The site is very similar to the "big four" above. You can create a free account, but you can also buy a paid account, where you can post photos of your best work, list a few reasons why you're the best MUA in town, and reply to comments. Another very, very popular wedding site, where brides and grooms go to find local vendors and book their services. The Knot advertises that 8 in 10 U.S. brides use their wedding network, and that they have more "affluent visitors" to their site than any other wedding website—which is a very interesting selling point. They seem to have fewer makeup artists listed, but they're still incredibly popular, and they have a few very important sister sites owned by the same company (including The Bump). How Do I Use The Knot? You can check out one of their sample "storefronts" and visit their vendor sign-up page for more information. You can also talk to them on the phone by calling (877) 331-7752, which is nice. Not all websites have a number you can call. There are far fewer makeup artists listed here, but that may be a good thing: the site is gorgeous and easy to navigate, and maybe fewer MUA listings will mean that your profile stands out. There are, however, far fewer reviews, and that is typically something that scares brides off. They want to dozens and dozens of positive reviews, so that they can feel good about hiring you. How Do I Use My Wedding? Check out their Vendor Registration page and set up a Media Kit. Similar to many of the wedding planner sites, they don't list their vendor pricing plan, so you'll need to contact them to see how much a listing will cost. You can do really, really well for yourself if you live in a metropolitan area and are a sought-after bridal makeup artist. These folks make a GREAT living. If you want to get into your local bridal market, check out these sites, and see which one works best for you! There are fewer options here, but it's something we don't want to leave out—especially because so many makeup artists are able to supplement their incomes by giving private lessons. CourseHorse.com. The site can be a great place to experiment with providing classes—you may find that you love being a MUA, but you truly enjoy being a teacher. If you take a look at the site, you'll see that some classes are very inexpensive, and others are quite pricey. Note: CourseHorse.com is only available for certain cities; hopefully that'll change soon. EventBright.com. Unlike Course Horse, there are MANY cities listed on EventBrite, and plenty of private classes offered. A site you will definitely want to look at if you're offered private tutorials. Yellow Pages. They're not as popular as they once were (and at one time, they were VERY popular), but the Yellow Pages lists local makeup artists who offer lessons. You'll need to figure out if they're a good place to list your teaching services. Local Online Newspapers. If you're interested in given lessons, try to find local publications where you can list your classes and programs. Here's a great example of an online local newspaper (for a neighborhood in Manhattan called Tribeca) where you could post an inexpensive ad for classes. Definitely something to check out! Keep in mind, you can offer private classes on Yelp and Thumbtack, as well. Craigslist.com. There are still a TON of people who use Craigslist, so it doesn't hurt to add your information and make a page. It's free, it's super-simple, and it's one of the most popular websites in the world. Worth checking out. Here's how most people do it: you plant a bunch of seeds and see which ones sprout. Try paying for memberships on Yelp, on GigSalad, on Wedding Wire, and see which site brings you the most business. You may find that in your area, people on Yelp are much more likely to use your services. Or you may find that your Yelp profile doesn't bring in much business, and you do much better paying for a Wedding Wire membership. Or, business is booming, and you decide to keep both. In other words, you'll need to try a few things, and see what works for you in your local market. You'll have to review them from time to time to make sure your reviews are good. Once every two weeks should do it. Because if anyone leaves you a negative review, you need to be on top of it and defend yourself! Here's an example of a makeup artist named Vesta in Brooklyn, NY, who did an excellent job "reviewing her reviews". If you look at the review left on July 28, 2014, a client leaves a negative review and tells everyone that Vesta was late for an appointment. As we mentioned in our "Be On Time" post, it is SUPER important that makeup artists be seen as punctual. Vesta gently defends herself and states that she did, in fact, show up on time, and that the reason the shoot was delayed was because the client requested a new look. She even ends her rebuttal with a compliment, saying that the client looking stunning (very professional, yet to the point). Had Vesta not reviewed her reviews, potential clients might have seen the complaint, and been less likely to request her services. If you can cultivate your online presence, your business will flourish. Keep in mind, you still need your own website, but if you cultivate your presence on the sites we listed, you will be in FANTASTIC shape and your business will continue to grow. Finally—there are always new sites that are popping up, so if you know of one we missed, let us know!